NEW YORK--(BUSINESS WIRE)--Positioned at the intersection of tech, design, business, and innovation, NYC-based startup Jabbrrbox is revolutionizing the modern travel experience, one public space at a time. Eight of the brand’s connected workspaces have just been installed in New York’s LaGuardia Central Terminal B, a major hub that sees over 15 million travelers annually. The work booths deliver acoustically-sound, private spaces with free, reliable, and secure WiFi, flight-tracking abilities, terminal maps, and a photobooth app, with expansions including Bluetooth connectivity for hands-free calling, a camera for video conference calls, in-booth speakers, screen-sharing capabilities, and speakers for music and handsfree calling. 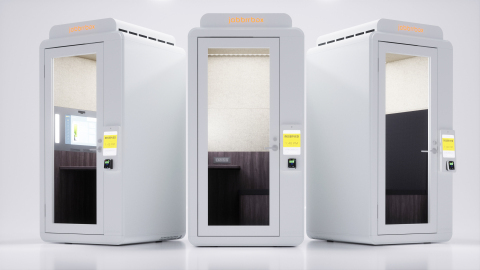 A breakthrough solution for the increasingly mobile workforce, Jabbrrbox’s consumer service is the perfect environment for on-the-go work, wellbeing, and on-demand privacy. The well-designed and comfortable interior of the booths features superior acoustic qualities as well as proprietary enterprise technology developed with Andrew Southern, Chief Technology Officer of Jabbrrbox. The booths are outfitted with lighting adjustments, flight-tracking, wayfinding, and secure WiFi for a private, encrypted network. As an on-demand consumer amenity, users are able to access the Jabbrrbox in 30 minute increments ($15/30 min), with a door passcode and WiFi password provided at the time of reservation. The brand will continue to expand its on-demand consumer service in a wide variety of open and semi-public spaces including building lobbies, hospitality, conference & venues, retail, transit hubs, additional airports, etc throughout 2018. ABOUT JABBRRBOX: Jabbrrbox is a workplace solutions company bringing privacy to commercial and public spaces. Founded by Brian Hackathorn, a former Associate Principal at Studios Architecture, and Jeremy Jennings, an entrepreneur with a dynamic résumé that includes positions at Fortune 500 businesses and commercial interiors companies, it combines technology, comfort and privacy. The Jabbrrbox solution fills a critical void in the public and private marketplace and is engineered for today's modern mobile workforce. ABOUT LAGUARDIA GATEWAY PARTNERS: LaGuardia Gateway Partners (LGP) was selected by the Port Authority of New York and New Jersey to operate and deliver an extensive capital redevelopment project at LaGuardia Airport’s Terminal B that will provide world-class terminal facilities and operations for passengers and airlines. LaGuardia Gateway Partners is composed of Vantage Airport Group, Skanska, Meridiam and JLC Infrastructure for development and equity investment. Skanska Walsh as the design build joint venture; HOK and WSP | Parsons Brinckerhoff for design; and Vantage Airport Group for management of the terminal operations. LaGuardia Gateway Partners’ members have worked on more than 350 aviation and transportation projects globally and domestically, including international airports in New York (John F. Kennedy), Chicago, Doha, Delhi, Los Angeles, Santiago, and Nassau.